It isn't often we cover posthumous releases here at The Witzard, but honestly, we just couldn't pass up an opportunity to cover Gearbox Records' newly-unearthed 5-track collection, MØNK. World-renown American Jazz pianist and composer Thelonious Monk, unfortunately, passed away back in 1982, although, his estate has continually released a slew of previously unissued recordings since his untimely passing. Not entirely unlike similarly-minded "lost" albums John Coltrane's Both Directions at Once, Miles Davis & John Coltrane's The Final Tour: The Bootleg Series, Vol. 6, and Monk's own Les liaisons dangereuses 1960, MØNK was initially recorded at a live concert held at Old Fellow Palæet in Copenhagen, Denmark on March 5th, 1963. MØNK features the genre-shaping talents of Thelonious Monk's most widely-acclaimed Quartet: sax player Charlie Rouse, future Sun Ra Arkestra bassist John Ore, and drummer Frankie Dunlop, who all previously appeared within Monk's 1963 albums, Monk's Dream & Criss-Cross. "The original tape was a Scotch broadcast tape amongst a collection of delights we bought from a Danish producer, who had literally, picked them from a skip [dumpster] some 20 years ago," according to Gearbox Records owner/founder Darrel Sheinman. "He was going to use them to sample and remix during the Acid Jazz heyday, but didn't have time," Sheinman further explained. It's believed the Thelonouis Monk Quartet's performance was recorded by the Danish Broadcasting Corporation and aired four days later, on March 9th, 1963, for a local radio audience; however, it appears as though the original broadcast was the only time the recordings were widely heard... until now! Oddly enough, it appears as though no one ever even knew the raw tapes for MØNK ever even existed, until Gearbox's Darrel Sheinman, literally, saved them from being thrown in the trash and discarded forever without being heard. 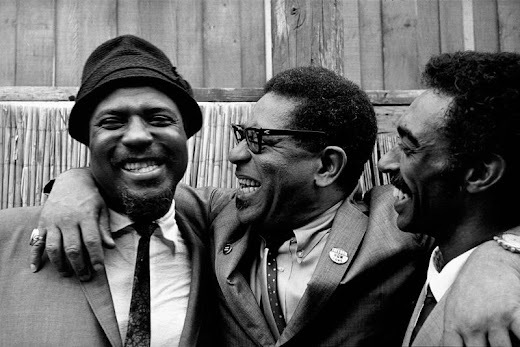 "Bye-Ya," "Monk's Dream," and "Body & Soul" previously appeared within the Thelonious Monk Quartet's album, Monk's Dream, released earlier the same year. "I'm Getting Sentimental Over You" was previously released on a 1960 Riverside Records 7-inch issued by Thelonious Monk Quartet Plus Two, while "Nutty" was originally released on The Quartet's 1958 live album called Misterioso. MØNK took several years to create because Darrel Sheinman & Gearbox Records painstakingly created a special all-analogue AAA recording, which is analogue through and through, all the way from the source to 180g vinyl LP's and CD's. "AAA" meaning Analogue recording, Analogue mix, and Analogue master with no digital technology whatsoever anywhere in the path. "We felt this was the only way to produce, probably, one of the best Monk renditions we have ever heard," Sheinman explained. Thelonious Monk Quartet's MØNK is now available to purchase, download, or stream on Gearbox Records' Bandcamp page, as well as select digital and physical retailers. Honestly, for entry-level Jazz/Hard Bop fans or listeners new to Thelonious Monk's music, much like myself, MØNK seems like a perfect jumping-off point into his storied 66 year-long (and counting!) discography.